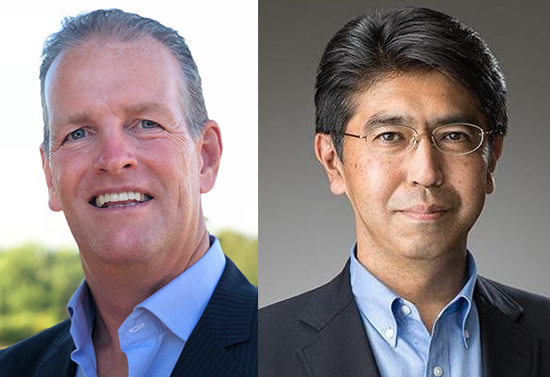 SEGA of America (SOA) and Atlus UUS announced that Ian Curran (above left) and SEGA of America President and COO becomes President and COO of Atlus US. and work alongside SEGA West CEO Tatsuyuki Miyazaki (above right) to further the financial goals of both SEGA of America, Inc. and Atlus U.S.A., Inc. Mr. Miyazaki will assume the role of Atlus U.S.A., Inc. CEO as Naoto Hiraoka steps into a role to focus as Atlus brand owner. Recognized for his contribution to and leadership of ATLUS U.S.A., Inc. and the resulting success of titles like Persona 5, Catherine and SMT series, Mr. Hiraoka will now move forward leading many of the company's important creative projects. "I'm so proud of the work we've done at Atlus U.S.A., Inc. and Mr. Miyazaki and Mr. Curran will continue to guide the company to even greater success," said Naoto Hiraoka, former President and CEO, Atlus U.S.A. Inc. and Senior Vice President, SEGA of America, Inc. "I look forward to creating more exciting projects with the creative team at ATLUS in Japan, and wish my colleagues the best of luck growing the business in the Americas and EMEA." Mr. Hiraoka will remain on the board of Atlus U.S.A., Inc. and SEGA of America, Inc.
"I'm eager to grow my role as the new President and COO of Atlus U.S.A., Inc. and greatly appreciate the support that Mr. Hiraoka has given me up to this point," said Mr. Curran, President and COO, SEGA of America, Inc. "Across the SEGA and ATLUS families, we've had an incredibly successful year, and there is still so much to look forward to. "We wish Mr. Hiraoka the very best of luck in his role and are thankful that he'll still be a valuable asset to the ATLUS team," said Mr. Miyazaki, CEO, SEGA West. "I'm thrilled to play a greater role in the continued success of Atlus U.S.A., Inc. and work alongside Ian, who has done an incredible job in just a couple of short months in his role as President and COO of SEGA of America."